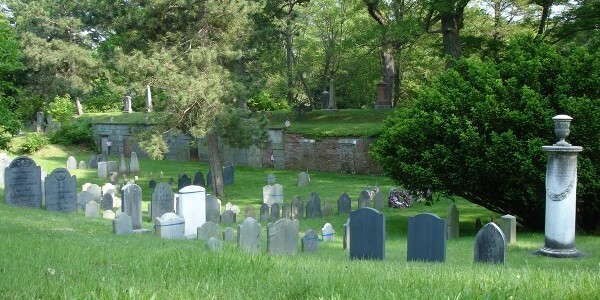 Established as Brookline's first burying ground in 1717 on a half acre of land. Served as the town's only burying ground for a hundred and forty years. Enlarged by three quarter acres and redesigned as a rural cemetery in 1840. Active use spans two hundred years. Notable interments include: Mary Boylston (1722), great-grandmother of President John Adams; Anna Mather (1737), second wife of Puritan minister Increase Mather; Edward Devotion (1744), benefactor of Brookline schools; Zabdiel Boylston (1766), pioneer of smallpox inoculation; Samuel Philbrick (1859), abolitionist; and Francis Channing Barlow (1896), Civil War General and New York State Attorney General. A monument to Hugh Walker Ogden (1938), World War I Colonel and presider over hearings on the Boston 1919 molasses disaster is also present.